Colorado’s congressional Democrats said at a Monday morning news conference at Denver International Airport that President Trump and Senate Majority Leader Mitch McConnell were holding government workers “hostage” while the president throws “temper tantrums” over a border wall that has ever-shifting funding sources and while the longest-ever government shutdown continues. From left to right: Rep. Joe Neguse, Sen. Michael Bennet, Rep. Diana DeGette, Rep. Jason Crow and Rep. Ed Perlmutter. DENVER – Colorado’s congressional Democrats said at a Monday morning news conference at Denver International Airport that President Trump and Senate Majority Leader Mitch McConnell were holding government workers “hostage” while the president throws “temper tantrums” over a border wall that has ever-shifting funding sources and while the longest-ever government shutdown continues. The partial shutdown, which has affected around 800,000 federal employees across the country and around 15,000 in Colorado, the lawmakers said, entered its 24th day on Monday. On Saturday, it became the longest shutdown in the nation’s history, and Congress was not in session over the weekend. 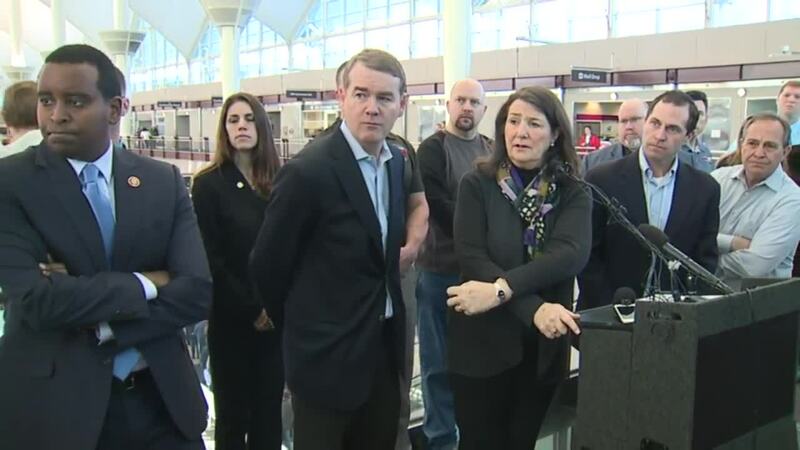 Colorado’s congressional Democrats – Sen. Michael Bennet and Reps. Diana DeGette, Joe Neguse, Jason Crow and Ed Perlmutter – held the news conference alongside an air traffic employee union representative, an Environmental Protection Agency scientist and other federal workers with TSA security lines as a backdrop. “I think everybody knows that work stress is not fun, and then having to worry about the health and wellness of your family also is not a stress you’d like to have,” said Josh Waggener, the state and regional representative for the National Air Traffic Controllers union, which sued the Trump administration over the shutdown last week as air traffic controllers worked without pay and received either zero or little money in their checks last Friday. “To add financial stress on top of that, where we have people who are having to take out loans to pay their bills and still not knowing when they’re going to be able to pay those loans back either, that’s just something that is one of the little things that is a byproduct of this shutdown that I think people need to be aware of,” Waggener added. Waggener said some union members had asked if they would legally be allowed to take on a second job, which he said might be necessary for some families but wasn’t something the union was necessarily encouraging. “They can do that, but it’s not something we want them to do because we want them to be prepared to come to work and perform their air-traffic-controller job No. 1,” he said. Last week, the four House members present at Monday’s press conference issued a joint statement calling for an end to what they said was a “senseless” shutdown. They and Bennet elaborated on Monday after a weekend of inaction and more pressure from Trump on Democrats to give in to his requests for $5.7 billion in border wall money. “This is a self-inflicted wound by the president of the United States and it should end,” Bennet said. Neguse called the situation a “travesty” and DeGette asked if this was the America that President Trump thinks he should be presiding over. Crow asked about the thousands of veterans who have continued their service by working in the federal government but who were working without pay, saying they were being “held hostage’ and being used as “a bargaining tool” by the president and McConnell, R-Ky. The Democrats placed the blame for the shutdown squarely on Trump and McConnell’s shoulders, though the president and some Republicans – especially in the Senate – have continued to blame House Speaker Nancy Pelosi, D-Calif., and Senate Minority Leader Chuck Schumer, D-N.Y., for not caving to their demands despite the Senate unanimously passing a continuing resolution that would have kept the government open in December. The House, which was still in Republican control at the time, however refused to hold a vote on that measure and instead passed one with the border wall money that the Senate never took up. Since then, President Trump has dug in his heels on keeping the government closed until he can get his pet wall project started – even considering declaring a national emergency to take money from disaster funds in order to fund part of a wall that he has consistently told his supporters Mexico would pay for. And McConnell has vowed to block any measures passed by the newly Democratic-led House that do not contain the wall funding – something he held true to last week after the House passed several measures to reopen several agencies currently shut down. Most Democrats and some Republicans have called for him to bring the measures to the floor in order to vote and to test Trump’s veto pen. Several of the lawmakers mentioned other bills that have passed in the past that could reopen the government, and they also noted that there were several past bills that contained the wall funding the president has called for that were rejected either by past Republican congressional leaders or by Trump himself. Perlmutter pushed back against a question about why Democrats weren’t negotiating something in exchange for the wall funding in order to reopen the government. The Democrats said they wanted to reopen the government and would then be willing to negotiate a border security package – something party leadership has said since the shutdown began. Bennet and 11 other Senate Democrats also sent a letter to Trump on Monday urging him to be aware of the impact of the shutdown on wildfire preparation. But some Republicans are still putting the onus on Democrats. Rep. Scott Tipton, R-Colo., called the Democrats’ display “political posturing” in a statement and said that unless Pelosi is willing to pass a comprehensive border security measure that the government would stay shutdown. The offices of Reps. Ken Buck and Doug Lamborn – the state’s other two Republican U.S. House representatives – did not respond to requests for comment Monday. Bennet noted that the Gang of Eight immigration bill he helped draft and which passed the Senate in 2013 in bipartisan fashion but was never brought up in the Republican-led House had $46 billion worth of border security money and included 350 miles of border fencing that is similar to what the president is asking for now. He also noted that the bipartisan immigration measures that he and Sen. Cory Gardner, R-Colo., worked on last year would have included some of the same funding but was shot down by Trump and McConnell over DACA protections. Both also jointly cosponsored the DREAM Act last year, which McConnell also objected to as a host of immigration measures failed. Bennet said that he would “guarantee” that if McConnell brought similar measures to the floor that “both senators from Colorado would support it” and would override the president’s veto. Gardner told Denver7 at the beginning of the month he didn’t think the government should be shut down while immigration reform and border security measures were worked out. Responding to Bennet’s comments Monday, a spokesman for Gardner said that is still the case and said Gardner would support measures like the ones he and Bennet worked on in 2017 and 2018. “Senator Gardner strongly supports efforts to take further action to increase funding for border security and begin to fix our broken immigration system, but doesn’t believe shutting down the government is the best course of action,” spokesman Jerrod Dobkin told Denver7. But it is unclear which side might budge first. Democrats are newly-empowered after taking the House, and polls out over the weekend show a majority of Americans do not believe a wall is necessary but do believe that Trump and Republicans own the most responsibility over the shutdown. Still, Trump told a farm convention in New Orleans Monday that he would “never, ever back down.” One of Trump’s main allies, Sen. Lindsay Graham, R-S.C., on Monday encouraged the president to reopen the government for a few weeks to continue wall negotiations with Democrats and to declare a national emergency if a deal is not reached. But Colorado’s Democrats seemed clear that they were far more concerned with getting the state’s federal workers back to work than they were about building a wall. “Colorado – we are very lucky to have such a strong federal workforce. But right now, they’re getting hurt and we’ve got to do something about that,” Crow said.